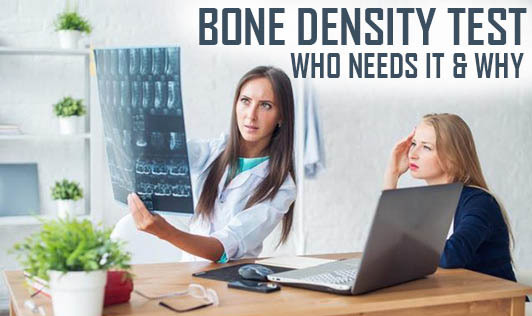 Bone Mineral Density (BMD) is an indicator of osteoporosis and fracture risk. The lower the BMD, the higher is the risk. To find out the bone density, a scanner called DEXA is used. DEXA is currently the most widely used test for BMD. Gender - women are more susceptible than men. Who needs to undergo BMD test? Any person who is at risk needs to undergo this test. The test can help to prevent, control or postpone osteoporosis. The results of a BMD test are normally given as T-score and Z-score. T-score of -1 or higher is considered normal. T-score between -1 and -2.5 is called osteopenia and T-score of 2.5 or lower is osteoporosis. A negative Z-score means you have thinner bones than the average person of your age and a positive Z-score means that you are better. Meet your doctor to find out if you need the BMD test. If you undergo the first test, your doctor will be able to tell you if you need to take the next test depending upon your bone health status.